In December of 1776, decimated by superior British forces, suffering from disease, desertion and lack of funds, General George Washington faced the unthinkable � losing the war. Despite all advice to the contrary, Washington made a courageous decision that is considered to be one of the boldest in military history. On Christmas night with the American Revolution hanging in the balance, Washington took his army across the ice-choked Delaware River. The next morning, he led a surprise attack against a garrison of English troops and battle-hardened Hessian mercenaries in the Battle of Trenton. The overwhelming and miraculous victory turned the tide in the war and changed the course of history. 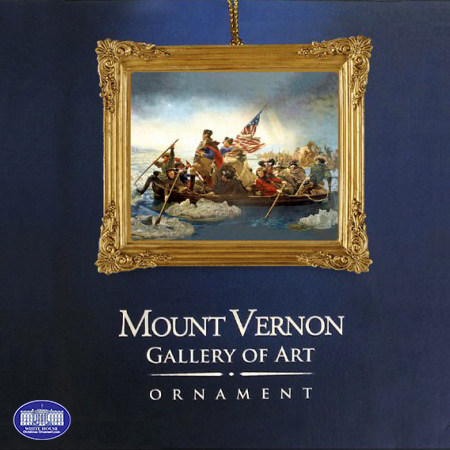 Mount Vernon's Gallery of Art ornament is an image of artist Emanuel Leutze's painting of the 1776 events in an antiqued gold resin frame. The ornament is 2" x 2 �". Includes red ribbon for hanging.